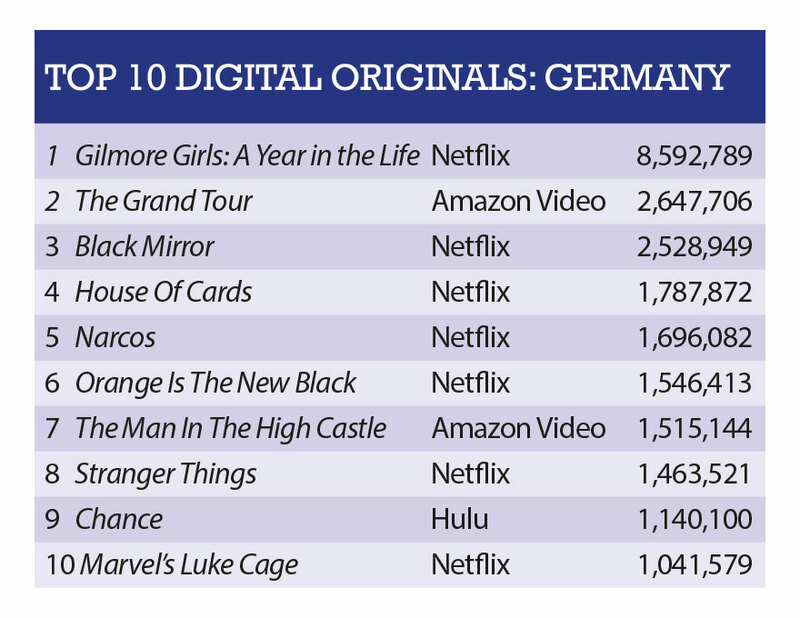 Netflix’s reboot of US comedy series the Gilmore Girls is leading the pack in Germany, some distance ahead of Amazon’s biggest ever commissioned series, The Grand Tour, our latest In Demand charts reveal. 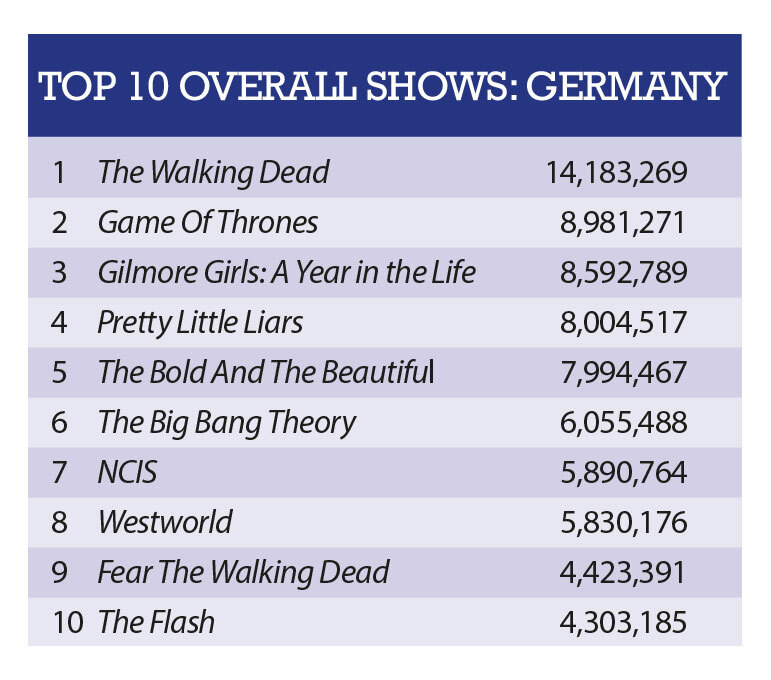 The latest exclusive data set from influential analytics firm Parrot,covering November 27 – December 3, reveals the Gilmore Girls: A Year in the Life was the most in-demand digital series in Germany, the largest TV market in Europe. It registered over 8.5 million Demand Expressions (Parrot’s exclusive way of measuring consumer demand – see footnote). Amazon’s mega-budget Top Gear rival The Grand Tour placed second with 2.6 million Demand Expressions. The originals top ten was, as is usually the case, dominated by Netflix, but Hulu also registered, with Hugh Laurie original series Chance placing ninth with 1.1 million Demand Expressions. Netflix originals Black Mirror, House of Cards, Narcos and Orange is the New Black all featured. Amazon’s second entry was The Man in the High Castle. In the overall rankings AMC’s The Walking Dead and HBO’s Game of Thrones continue to duke it out, with the zombie series winning out on this occasion. HBO’s much-vaunted sci-fi film-to-TV reboot Westworld, meanwhile, ranked a disappointing eighth. The show has performed well in English-speaking markets, but its performance in Germany is a let-down for HBO. Continuing its stellar showing, Netflix’s Gilmore Girls spin-off was third in the overall chart, ahead of Pretty Little Liars, daytime soap The Bold and the Beautiful and The Big Bang Theory. The Cartoon Digital 2016 event got underway in Munich this week and Parrot has also homed in on kids programming on the German market for TBI. 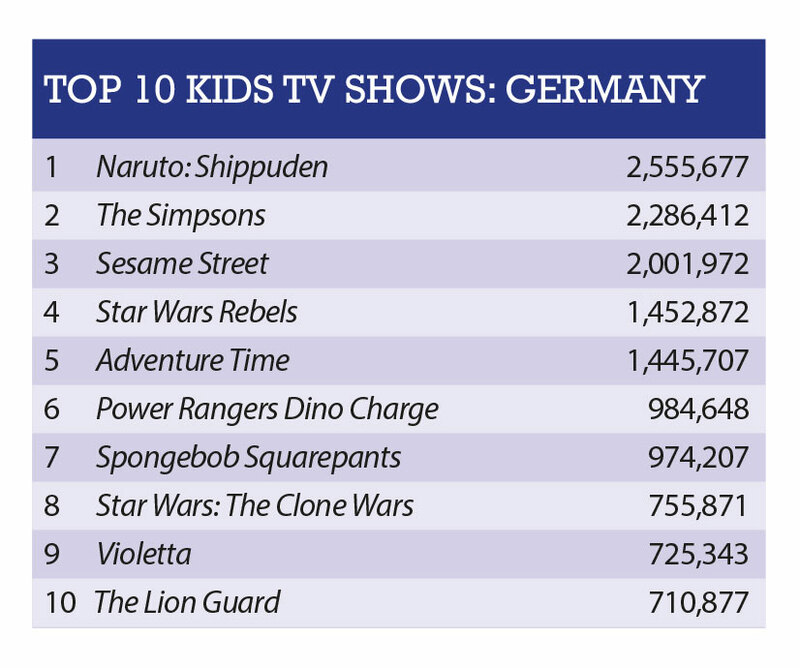 Japanese animated series Naruto: Shippuden has successfully built a significant fan base across the world over the past years, and placed at the top of the rankings. Long-running programme such as The Simpsons and Sesame Street feature heavily, as do franchise-based titles such as the Power Rangers Dino Charge and two Star Wars offering: Star Wars Rebels and Star Wars: The Clone Wars. Parrot does, however, flag the success of two of Disney’s shows, live-action regionally-produced telenovela Violetta (below) in ninth, and new animated show The Lion Guard one behind in tenth. The latter’s demand will likely increase over time, Parrot notes, because Disney has announced a second season renewal. *Source and methodology: Parrot Analytics assesses demand for popular shows through various ‘demand expression platforms’ including social-media and photo-sharing platforms such as Facebook and Instagram, blogging and microblogging platforms such as Tumblr, wikis and informational sites, peer-to-peer protocols and file-sharing platforms. Parrot’s artificial-intelligence systems assess billions of data points to reach the overall demand rating. Will 2019 mark the end of niche SVOD?